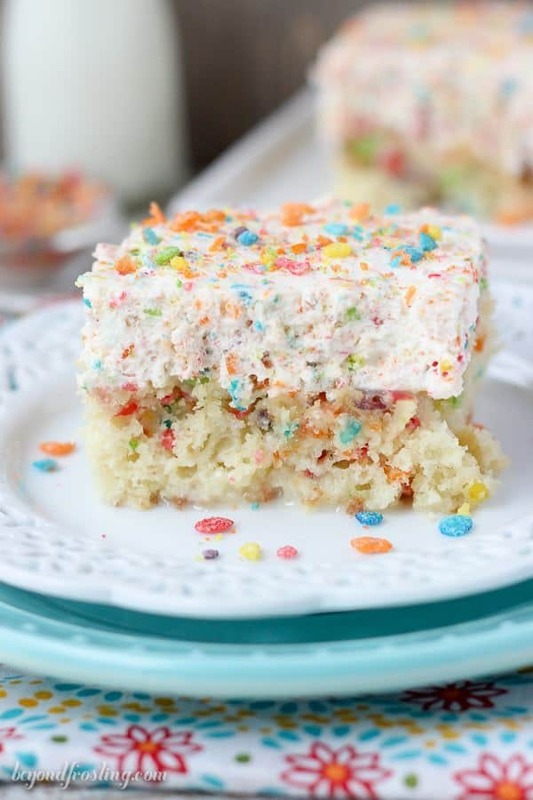 If you love Fruity Pebbles, this poke cake is for you! 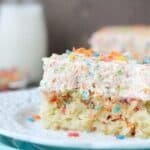 This is a Fruity Pebble filled vanilla cake, soaked in sweetened condensed milk and topped with a Fruity Pebble Whipped Cream. It’s a cereal milk inspired poke cake! If you follow me on Instagram, you may have noticed I shared some pretty big news on Sunday. Over the weekend, my boyfriend got down on one knee, in the snow and ask me to marry him. It was better than I ever could have imagined. It was just us and the top of a snowy run and I was completely surprised. We spent the rest of the weekend celebrating, and there was definitely champagne and pizza involved. I hope to share the whole story with you guys soon. I haven’t been able to stop smiling since the whole thing went down. But wedding planning? I am not there yet. I thought it was only appropriate that we celebrate with CAKE. What do you think? It’s no secret that I like poke cake, it’s the 4th one I’ve share so far this year and believe me, I’ve got a few more up my sleeve. 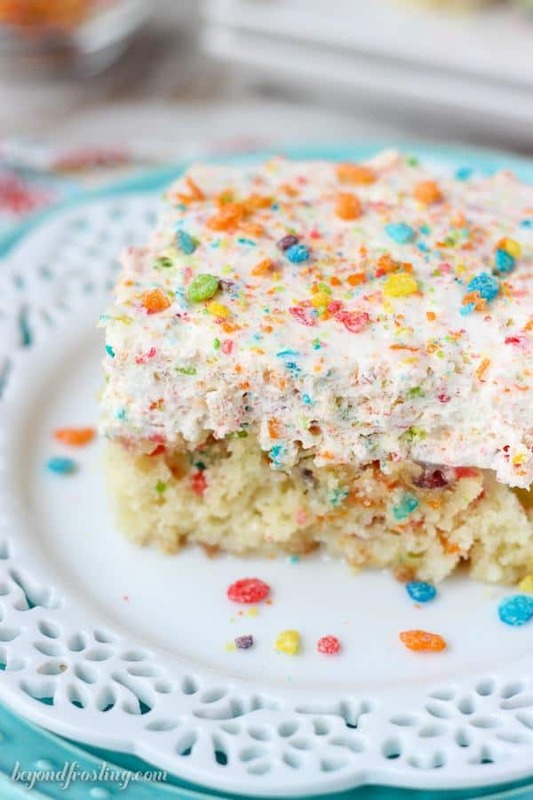 This time, we’re talking Fruity Pebbles Cereal Milk Poke Cake. I don’t know what it is, but I can’t seem to get enough Fruity Pebbles. They are colorful, sweet and loads of fun in a bowl. I’ve stuffed them in cookies, cheesecake and even an ice cream cake. 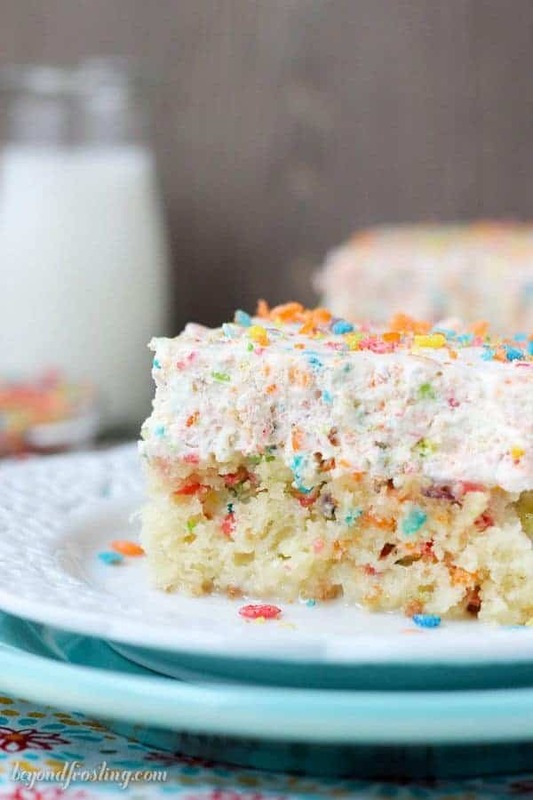 When Fruity Pebbles are baked into a cake, they soften, but every bite still has that burst of fruity flavor. Some people even asked me if they were sprinkles. 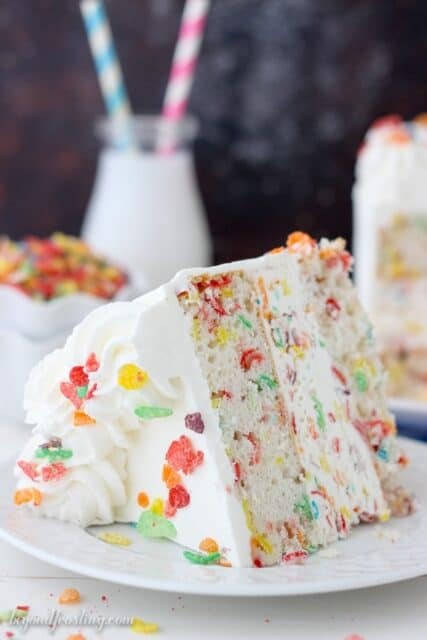 The thing with the Fruity Pebbles in the cake is that you can’t overdo it with the cereal or it will weigh down the cake. After some trial and error, I have found just the right amount of cereal so every bite is loaded but the cake itself still remains fluffy. 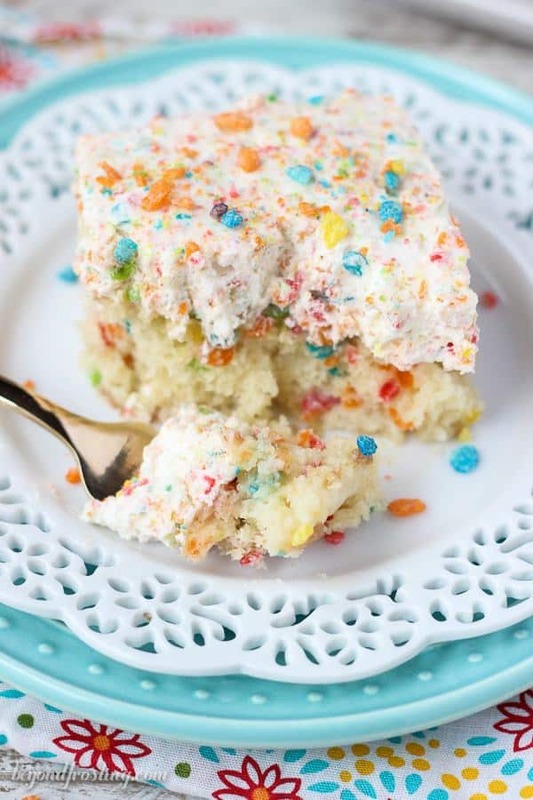 If for some reason your cake sinks a little bit in the middle, you don’t need to worry about it because you’re going to cover it with a Fruity Pebble Whipped Cream. You heard me correctly. Fruity-Pebble-Whipped Cream! This cereal milk inspired topping is the perfect ending to an already cereal-packed poke cake. When it comes to the whipped cream, I took two different approaches to find out which one I preferred. First I tried making actual cereal infused heavy cream by soaking the heavy cream with Fruity Pebbles for a couple of hours. I was not happy with the results. This doesn’t seem to work as well for large amounts of heavy cream. The cereal absorbed so much of the cream that I felt it was a waste and didn’t deliver the result I was looking for. So I have decided option two was a better bet. I made a traditional whipped cream and folded in crushed Fruity Pebbles. Once this sits in the fridge for a bit, the flavor of the cereal soaks right into the whipped cream, and it is just as dreamy as you might imagine. I opted to use a little bit of gelatin to help create a more mousse-like texture for the topping. 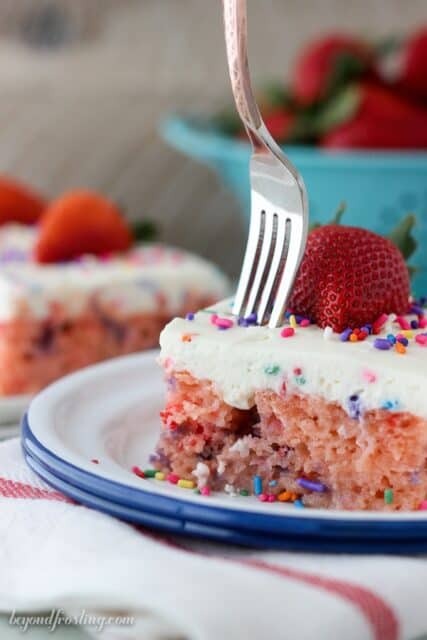 The last important part of a poke cake is the filling! My preferred filling is usually pudding, because it’s a very refreshing contrast to the cake. However, a can of sweetened condensed milk is a much better fit for this cake. 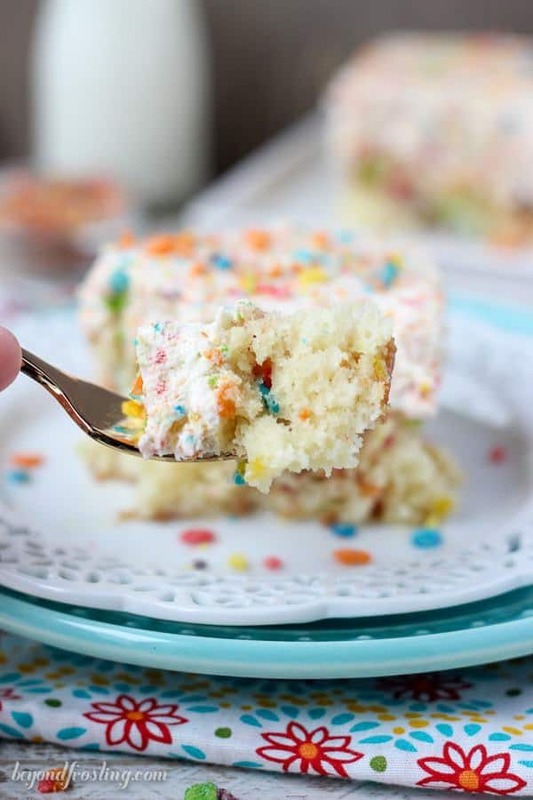 It gives this cake a tres-leches-like texture and add to the overall cereal milk effect. One thing is for certain, this is a guilty pleasure! Fold in the Fruity Pebble cereal until well combined. For the topping: Pour a can of sweetened condensed milk over top of the cake and allow the cake to cool completely and absorb the sweetened condensed milk. Put the bowl and whisk attachment in the freezer for 5-10 minutes to get them really cold (this step is optional, but is a common practice I use). In a small dish, combine 1 tablespoon of cold water with 1 teaspoon gelatin. Sprinkle the gelatin over the cold water and allow it to set to a solid. In a large Ziploc bag, crush the Fruity Pebbles until they resemble small crumbs. Measure out ½ cup of crumbs and set aside. Once set, microwave the gelatin for 8-10 seconds until it turns back to a liquid. In the cold mixing bowl, beat the heavy whipping cream on medium speed for about 1-2 minutes. Slowly drizzle in the gelatin and continue beating until soft peaks form. Add the powdered sugar and increase the speed to medium high. Beat until stiff peaks form. Fold in the crushed Fruity Pebbles. Spread whipped cream over the top of cake. This cake must stay refrigerated. Can I prepare aheah of time and keep in frig for two days? Hi Pat, yes you can. I still prefer to add the whipped cream 1 ahead ahead of time that most. Thank you so much Amy! Enjoy!!! You got this. Zippidy Doo. Haven’t stopped smiling either. Shredder Wedder. Cake looks as great as your future. Congrats on your engagement! This cake looks like a great way to celebrate! 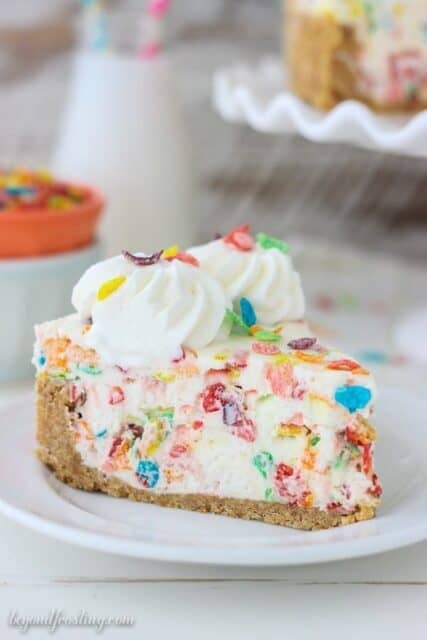 Love the fruity pebble whipped cream! LOL! You and me both! Aww that’s awesome Kim! Thank you!